Long Point, at the very fingertip of the curling arm of Cape Cod, was visited in 1620 by the Pilgrims after they entered Provincetown Harbor. A settlement began at Long Point in 1818, reaching its peak in the 1850s when about 200 people lived there. 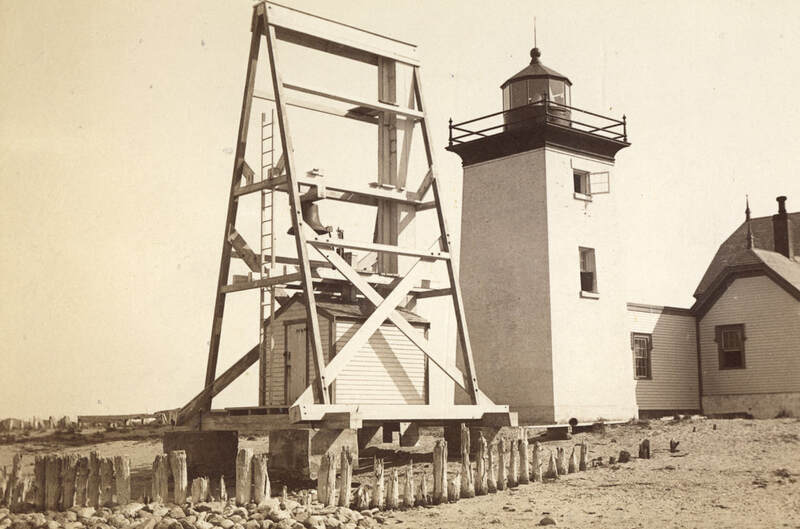 As Provincetown became a major fishing port, it was decided a lighthouse at Long Point would greatly aid mariners entering the town's harbor. The first lighthouse was completed in 1826 and went into service in early 1827. It consisted of a lantern on top of the keeper's house, with a fixed light exhibited 35 feet above mean high water, visible for 13 nautical miles. The first keeper was Charles Derby. For a time beginning in 1830, a school for Long Point children was operated at the lighthouse. I.W.P. Lewis' 1843 inspection provides many details about Long Point Light. The lantern at that time contained ten lamps and reflectors. One lamp, Lewis pointed out, had uselessly faced the door of the lantern for 18 years, costing the government $900 in oil. The wooden dwelling was erected on piles in the sand and was surrounded by a barrier built of spruce logs and sand, affording some protection from the surf. There was also an additional breakwater made from 1,800 tons of stone. Charles Derby was still keeper in 1843. He complained to Lewis that while he had a boat, there was no boathouse or landing place. He had lost a boat the previous year due to the lack of a proper slip. In its mid-nineteenth-century heyday, Long Point had a schoolhouse with 60 students and a sea salt industry, with windmills used to pump seawater into large vats. Henry David Thoreau reported about 1850 that lobsters were plentiful around Long Point and were caught to be sold to the New York market for two cents apiece. Josef Berger, in his book Cape Cod Pilot, said of the community at Long Point: "It was an exciting neighborhood to live in. Children who might have been afraid of dogs elsewhere, here ran from the sharks." The settlement at Long Point began to shrink around 1850, and by the Civil War there were very few people left. 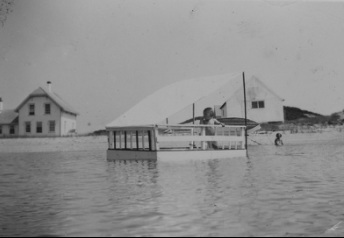 Many of the houses at Long Point were floated across the harbor to Provincetown's West End. These houses are marked today by plaques. During the Civil War, a Confederate warship was seen near Provincetown. In anticipation of a possible attack, two forts were built at Long Point close to the lighthouse. Local residents called the batteries "Fort Useless" and "Fort Ridiculous." Luckily no shots were ever fired in the vicinity of Long Point, other than Fourth of July salvos. Right: The 1875 buildings soon after they were constructed. New York Public Library. 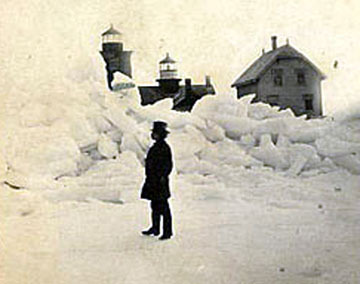 Above and right: Winter on Long Point c. 1875. Note that both the old and new lighthouses can be seen. Long Point Light was fitted with a sixth-order Fresnel lens in 1856. In 1873, an inspector reported that "a new dwelling is a necessity... the entire structure is in danger of being carried off by a heavy storm." $13,000 was appropriated for a new tower, keeper's dwelling, and fog signal. A new 38-foot brick lighthouse and a 1 1/2-story keeper's house were built in 1875. A 1,200 pound fog bell was installed at this time. The lantern held a fifth-order Fresnel lens showing a fixed white light. An oil house was added in 1904. In the early 1930s, Keeper A.G. Haskins lived at the lighthouse with his wife and three daughters. Mary Haskins, nine years old, had to be taken each morning by power boat to Provincetown's West End, 1 1/2 miles away, where she attended school. The trip was difficult in rough weather, but the Boston Globe reported in February 1932 that Mary had not missed a day of school that year. The Haskins family kept Long Point looking attractive, with a garden of dahlias and poppies in the summer. National Archives photo, circa early 1900s. In 1933, during one of the common thick fogs in the area, the mechanism that rang the station's fog bell broke down. Keeper Thomas L. Chase rang the bell by hand for over nine hours straight, pulling the rope with his right hand every 30 seconds. After a few hours of sleep he had to sound the bell for several more hours, this time with his left hand. Eventually the fog thinned out, but Keeper Chase said he was prepared to tie the rope to his legs to keep it going as long as was necessary. He said he felt like "a baseball pitcher who has twirled a couple of doubleheaders without rest." Long Point Light was automated in 1952 and the Fresnel lens was replaced by a modern optic. In 1982 solar panels were installed. The keeper's house and fog signal building were destroyed, but Long Point Light remains an active aid to navigation. The Cape Cod Chapter of the American Lighthouse Foundation has been licensed by the Coast Guard to restore and maintain Long Point Light. Above, left and right: Joseph R. Poindexter was the Coast Guard keeper at Long Point in 1949. 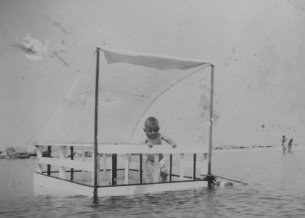 He constructed a floating playpen for his infant son, Norman. (Courtesy of Norman Poindexter.) In April 2010, Norman Poindexter (above right, photo by Bob Trapani, Jr.) was one of a group of volunteers who repainted the lighthouse. While in Provincetown, be sure to visit the Provincetown Heritage Museum, which has an exhibit on the settlement at Long Point. You can see Long Point Light distantly from MacMillan Wharf in Provincetown and you can walk there via a breakwater to Wood End at low tide, but the lighthouse is viewed much more easily from various boats leaving Provincetown Harbor, including a ferry to Boston and whale watches. A company called Flyer's runs a seasonal shuttle boat from Provincetown's waterfront to Long Point. The shuttle lets you off a short distance from the lighthouse. Left: The Pilgrim Monument in Provincetown, seen here in the background, is the nation's tallest granite structure at 252 feet. For more information or to donate to the restoration of Long Point Light, contact the American Lighthouse Foundation. The stairs inside the tower. 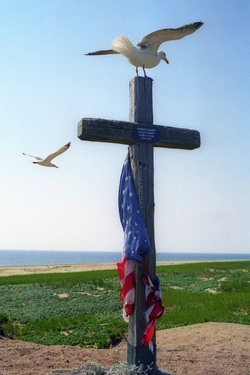 Photo by Bob Trapani, Jr.
Left: The cross near Long Point Lighthouse was erected by a club called the Beachcombers in memory of Charles Darby, who died during World War II.. He was a radio operator with the 77th Troop Carrier Squadron, based in England, and he died in a plane crash in October 1944. Darby loved Long Point. In the club's minutes, they called him "an unsung soldier who loved the dunes." The cross was originally erected in October 1946 at the Provincetown Art Association. It was later moved to Long Point. A plaque on the cross reads, "Charles Darby, Gallant Soldier, Killed in Action, October 17, 1944."